Tonight’s guest blog post, on the topic of creating a ‘how to’ book, is brought to you by guest blogger Alicia Rasley. I’d like to thank Morgen for asking me to guest blog again! This time, I’d like to talk about the experience of writing “how-to” books. First, understand that the only thing I know how to do is write, so naturally my how-to books are about writing. But I think the process will be similar no matter what the subject is. Here’s what I learned in developing my two writing books, The Story Within Plotting Guide, and The Power of Point of View, which might be useful to you if you’re considering writing a non-fiction how-to or support book. Topic choice: It’s essential to really care about this topic, because it’ll be central for a year or so! I don’t know if I could spend this much time writing about a topic that I wasn’t obsessed with. I did write a couple corporate histories years ago, and no, I wasn’t obsessed with the story of those two companies. But truly, if I hadn’t been getting a paycheck for the work, I probably would have given it up. So choosing two topics of interest (plotting and point of view) kept me interested. At the same time, I wouldn’t have been so eager to write if I already knew everything about the topic. For both books, the process of writing was a process of learning. I wasn’t taking dictation, but actually acquiring knowledge as I wrote. So I’ve learned, with non-fiction books, it’s good to choose a topic I want to know more about. Finding time: I’m basically a fiction-writer, so when I came up with these non-fiction project ideas, they didn’t have priority. And the task seemed so daunting, I was actually afraid to get started because I might learn I couldn’t handle it. But then I decided I would work on it for a particular hour every month—the third Tuesday at 11 am. One hour a month. Well, of course, I kept that schedule one month, but once I got going, I couldn’t stop. I kept going back adding a paragraph here and there. In a few months, I had a complete draft. Getting started: Fear of failure is a real problem for me, one that gets worse as I get older. I have gotten used to being pretty competent, so starting something new means I’m risking being incompetent.The moral of that story is writing a little bit leads to writing more—as long as you’re interested in the topic. I am also someone who gets intimidated with a large project, but impatient with outlining ahead of time. I want a sense of direction without losing the excitement of writing something new. What helped me was writing articles—1000 or so words on different aspects of the subject. So, for example, when I was writing about point of view, I wrote an article about how to individuate description depending on the narrator’s viewpoint. The tight focus on one small aspect of the issue made the article easy to write, but I also found it slotted right into the book with just a bit of introduction and analysis. Organizing: Once I get some material written, I can start organizing. My outline, when I get to it, starts with major sections. For example, in the plot book, I started with three big parts: Character, Conflict, Plot. Then I assigned each article and blog post to one of those sections, just by copying and pasting. Only then did I really start organizing, ordering what I already had and figuring out what was missing. I found it much easier to fill in the blanks when I already had part of each section drafted.Now I have a writing blog, and when I’m working on a how-to book, I try to write a few blog posts about some aspect of that topic. For example, I’m planning a book on writing emotion, so I’ve written blog posts about how to convey suppressed emotion, how to use parallel scenes to show emotional change, and how to use the opening sentence in the scene to show emotion through the setting. Not only does this allow me to effortlessly explore the topic, the blog commenters often supply me with questions and examples which I can use in my expanded analysis. Reorganizing: While I was on my own with the plotbook, I sold the POV book to Writer’s Digest Books, where I worked with a terrific editor, Lauren Mosko. She taught me a lot about how to make non-fiction material accessible to readers. Each chapter followed a basic template, and she used sidebars to delve deeper into complicated issues and illustrate examples. This was a great lesson in how to visually and logically present the points of understanding. I’m using these techniques in the how-to books I’m writing now, imagining the chapters as units of explanation that come together to make a complete analysis. Self-awareness: I’m pretty confident in my ability to explore a writing topic and find examples to illustrate my points. But I have a weak visual sense and no visual imagination. So I’ve learned to study how-to books that work for me to find out what they’ve done in the presentation to organize and illustrate. By identifying my major weakness, I’m halfway to overcoming it. Confidence comes from trying and succeeding, but sometimes failing has to come in between there. Now I know the best way to get beyond that fear of failure is to plunge in and write. And I’ve found that while a non-fiction book has its own internal logic and organic shape, I can learn strategies from each that can be applied to the next. Thank you, Alicia, that was great! 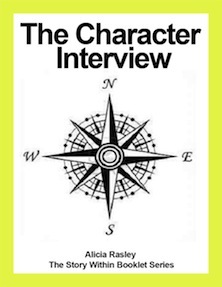 Alicia Rasley is the author of The Power of Point of View and The Story Within Plotbook. A nationally known writing teacher, she gives writing workshops around the country and online. She blogs at Edittorrent, and her writing articles can be found at her website. If you would like to write a writing-related guest post for my blog then feel free to email me with an outline of what you would like to write about. If it’s writing-related then it’s highly likely I’d email back and say “yes please”. The blog interviews return as normal tomorrow morning with science-fiction author, songwriter and poet Eleni Papanou – the six hundred and twenty-ninth of my blog interviews with novelists, poets, short story authors, bloggers, autobiographers and more. A list of interviewees (blogged and scheduled) can be found here. If you like what you read, please do go and investigate further. And I enjoy hearing from readers of my blog; do either leave a comment on the relevant interview (the interviewees love to hear from you too!) and / or email me. Tonight’s guest blog post, on the topic of ending story openings, 🙂 is brought to you by contemporary women’s fiction and Regency romance novelist, blogger and writing guide book author Alicia Rasley. I’d like to blog about openings to stories—that is, how to effectively start your story. It’s a subject big enough, I could write a book about it, and probably will! (Here are some posts on my own blog that discuss openings.) So to keep this relatively short, I want to focus on the all-important last paragraph. The beginning of a story has a lot to do, and it might be most helpful to write your opening, write the rest of your story, then come back and revise the opening so it is more effective in setting up the plot questions and themes. I was helping a friend with a story just today, and we discussed the “end of the beginning”. This book is about a girl raised in Europe who was forced by her parents to study piano for years. She is disillusioned by music and eager to get far away from her parents, so chooses a college in the US that has lost its music program. That’s the opening, setting up her college story. I suggested that the author think about what is going to happen later in the book. The college is going to resuscitate the music program and recruit the protagonist to be the first major, and in the end of the book she’s going to found her own punk band, showing that she has chosen her own way (not the parents or school). Boy! This is good, because it forces her to change, to learn to value her own talent, to choose rather than just react. The end of the opening, however, could set up the “praxis” of her journey, by posing a bit of a conflict or question. In a way, the last paragraph in the opening could serve as a “hinge” to the rest of the story, actually helping to open up to the rising conflict and rising action of the middle, and hinting at the theme that will be resolved in the ending. His first chapter has her choosing a college, deliberately selecting the one that has lost its music program. I suggested a final paragraph that would emphasize what the author wants the reader to think about. But to achieve that, he must identify what that is! Does he want the reader to think about her disorientation at being in the US after Europe, a fish out of water? Or her sense of her musical talent being trapped by the expectations of her parents even as she arrives in this new place? This sets up the conflict between her desire to be “merely a student” and her musical talent, and provides a concrete action (hurrying past the piano) to symbolize the beginning of her journey from resistance to self-acceptance. If the author wanted to emphasize her “fish out of water” aspect, how could that be achieved with the same situation (entering her first class lecture hall)? Maybe she could look around and realize that everyone else in the class is dressed down while she dressed up? Or that she has the wrong textbook? Another way to use that final paragraph in the first chapter is to set up a motif (a recurring thematic image or concept) which the rest of the story will develop. For example, in my Regency novel Poetic Justice, the first chapter pits the hero John against an enemy, who tries to trick him by offering an alliance and then trying to kill him. I was worried that the adventure of this opening would conflict with the quieter aspects of the rest of the story. But when I realized that no matter what the situation, John was always being “tested”, especially by the class system that scorns him as a tradesman. Thus, in the final paragraph of the first chapter, I emphasized this motif of “the test” to connect this scene with the rest of the story, which develops and finally resolves the recurrent pattern by having him pass the ultimate test by winning the heroine’s heart. Look at your own first chapter and think of how you might use that last paragraph to set up the rest of the book, by establishing the context or conflict, by posing a question the rest of the story will answer, or by connecting the first scene with the rest of the story using a theme or motif. Any examples from your work? Finally, I’d like to thank Morgen for asking me to guest blog here! You’re so welcome. That was great, thank you, Alicia! Alicia Rasley is a RITA-award winning novelist who has been published by major publishers such as Dell, NAL, and Kensington. Her women’s fiction novel The Year She Fell has twice been a Kindle #1 bestseller in the contemporary fiction category. Her articles on writing have been widely distributed, and many are collected on her website The Writer’s Corner. She also blogs about writing and editing at Edittorrent. Her Regency romance Poetic Justice is currently available as a Kindle Select book. 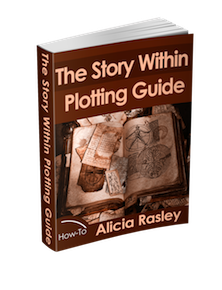 She is also the author of the plotting guidebook The Story Within, available for the first time in electronic format. The blog interviews return as normal tomorrow morning with fantasy and horror author Lea Ryan – the three hundred and fiftieth of my blog interviews with novelists, poets, short story authors, bloggers, autobiographers and more. A list of interviewees (blogged and scheduled) can be found here. If you like what you read, please do go and investigate further. And I enjoy hearing from readers of my blog; do either leave a comment on the relevant interview (the interviewees love to hear from you too!) and / or email me. You can also read / download my eBooks and free eShorts at Smashwords, Sony Reader Store, Barnes & Noble, iTunes Bookstore and Kobo. My eBooks are now also on Amazon, with more to follow, and I also have a quirky second-person viewpoint story in charity anthology Telling Tales. I have a new forum and you can follow me on Twitter, friend me on Facebook, like me on Facebook, connect with me on LinkedIn, find me on Tumblr, complete my website’s Contact me page or plain and simple, email me.